Presenting the final monster of today's mashup marathon: the polar wolf! I really liked the image of the cub, and it struck a strange chord of nostalgia for one of my favorite monsters from when I was much younger, the hoar fox (I know). Needless to say, this ended up being my favorite monster to work on, and I decided to save it for last. I hope you have enjoyed the monsters from today's blitz. Let me know in the comments which one you liked the best. I'll be back next week with a much saner solo monster entry. Thanks, as always, for reading! This unusual creature has a polar bear's build and a wolf's coloration; frost streams from the creature's mouth. At the top of the world, where the veils between reality and strange dimensions ravel more readily, spontaneous creature merges become more common. 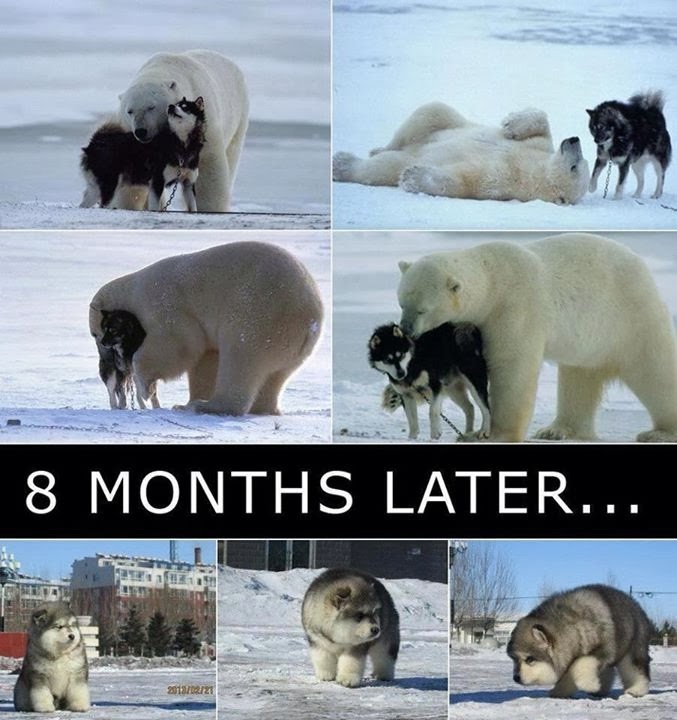 Such is the case with polar wolves, which blend the size and power of the polar bear with the hunting prowess of the wolf. Breath that can freeze foes in their tracks adds to the polar wolf's arsenal. The creatures have a decent intelligence and often wind up as companions to frost giants. The penultimate mashup in today's marathon is the dhorse. This was one of my favorite images, and I could easily imagine halflings coming up with this creature, one they could ride into battle or just to travel. Sure, it would be a little unnerving at first, but the friendly animal would quell that unease. The final monster of the day will arrive in an hour! See you then. 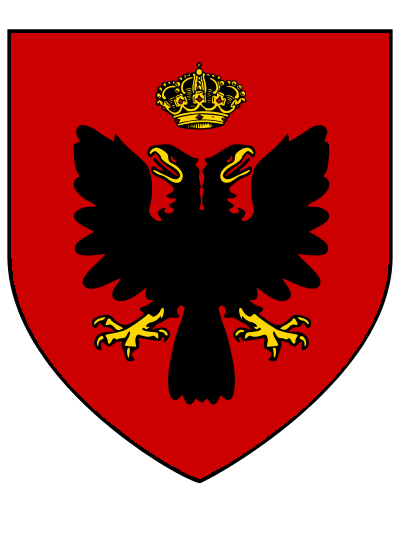 In place of this chestnut-colored horse's head is a dog's head; the animal paws at the ground and sniffs the air. 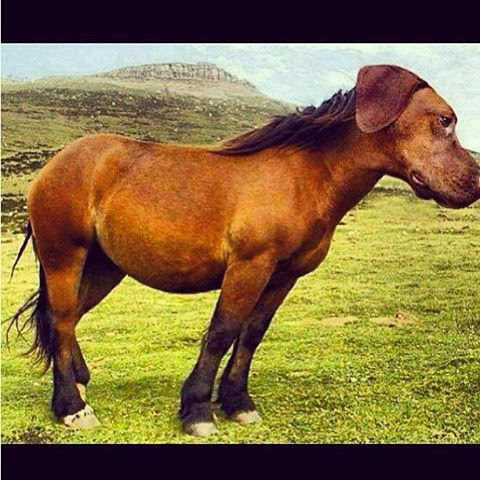 Halfling druids husbanded the first dhorses, with some magical assistance, and the resulting animals breed true. The animals are more loyal, and less headstrong and skittish, and they combine the best features of riding dog and horse. While some consider dhorses to be abominations, halflings are beginning to come around and choose them as mounts. Dhorses stand shorter than typical horses, but they happen to be the right size for halfling riders. Starting Statistics: Size Medium; Speed 40 ft.; AC +1 natural armor; Attack bite (1d4 plus trip), 2 hooves (1d3); Ability Scores Str 14, Dex 17, Con 15, Int 2, Wis 13, Cha 8; Special Qualities low-light vision, scent. 4th-Level Advancement: Speed 50 ft.; Ability Scores Str +2, Dex –2, Con +2. Here is another monster that refused to be constrained to the animal or magical beast categories. Thanks to working on this feature, I've come up with a sort of mythology around the dread krakens, self-styled rulers of everything below the waves and plotters of the surface dwellers' destruction. One thing dread krakens love to do is make octopus-themed monsters that they can inflict upon the surface world, and the koalapus is no exception. Two more monsters to go before this mashup marathon concludes. 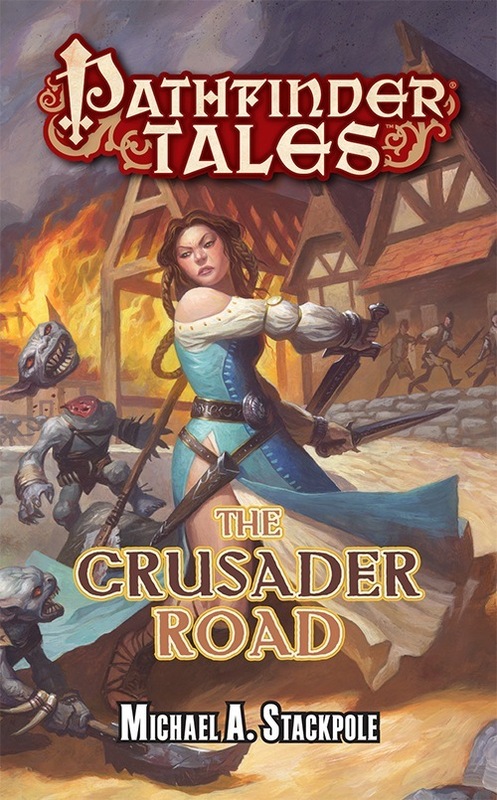 I hope you have been enjoying it thus far, and thanks for reading! He just wants to give you a nice, long hug. What at first appears to be a cuddly koala bear transcends into horror as the creature reveals the tentacled mass carrying it. Speed 30 ft., climb 20 ft., swim 60 ft.
Watery Tentacles (Sp) This variant of black tentacles works like that spell, but it can only be cast in water. It has a 20-foot-radius area of effect and can reach beyond the water's surface. Additionally, when a tentacle grapples a foe, it makes targeted dispel attempts (per dispel magic using the koalapus's caster level) against any spell or effect that allows a creature to breathe underwater. Dread krakens, taken with terrestrial legends about the drop bear, decided to create their own version, suited to their image. A koalapus is at home on the shore and underwater, but it prefers to stalk and attack prey on land. A typical tactic for a koalapus is to climb a tree of average height and wait for someone to pass under it, at which point the koalapus either attempts to grab something from the passerby or drops onto the unsuspecting victim. Thanks to their liquid variant of black tentacles, a koalapus is even more dangerous in water. 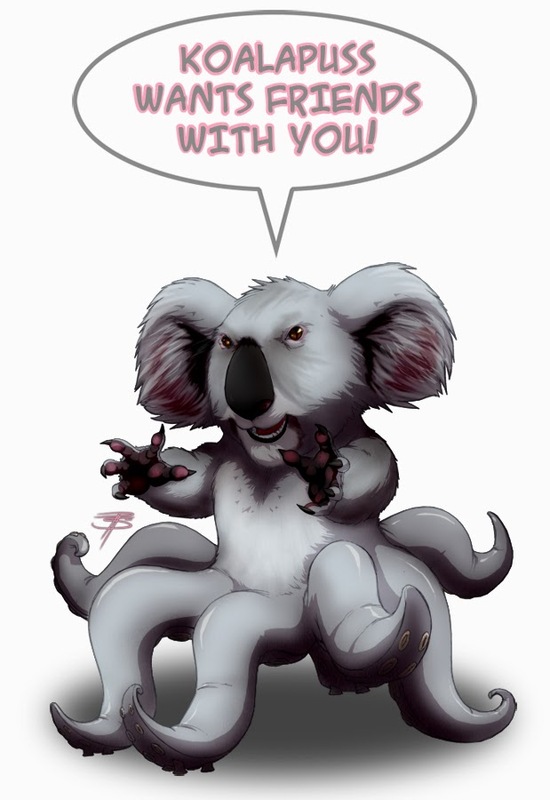 Despite the terror a koalapus sows in the dread krakens' service, they may have made a strategic error in creating the koalapus, for the creature is highly ambitious and will eventually desire to overthrow its master, with the aid of other koalapuses. Paris brought this image to my attention a while ago, and I squirreled it away for a rainy mashup day (oddly, it hasn't been raining while I've been working on these—perhaps it is wherever you are reading). Thanks also to Thomas LeBlanc who posted this image and provided the inspiration. Only three more monsters remain in the mashup marathon, and I hope you'll check back in an hour for the next one. Find out my secret origin here. This dog seems friendly, despite the appearance of several dangerous spines arranged on its body. Spines (Ex) A foe striking a bearasaurus with natural weapons, an unarmed strike, or a one-handed weapon takes 1d3 points of piercing damage. A creature grappling a bearasaurus takes 2d4 points of piercing damage each round it does so. A cross between a hunting dog and a stegosaurus created the first bearasaurus, and, despite the oddly personal nature of this creation, the formula has disseminated to others who have created bearasauruses of their own. Bearasauruses all possess a keen intellect and a strong desire to perform good deeds, much to the chagrin of those expecting yet another murder machine. This is not to say that bearasauruses will not harm another creature; they will definitely do so if it supports the greater good, or protects those with whom they ally. This image had been making the rounds through many gaming groups, and my group was no exception. I imagine there are several interpretations of this mashup out there, but that won't keep me from attempting my own. I ended up outfitting it slightly differently than what the image portrayed, and I hope you do like my interpretation. The mashup marathon is beginning to wind down, with only four monsters remaining. Check back in an hour for the first of those four! Carrying a lance, this hybrid of elephant and gorilla prepares to charge. A relatively new race, gorillephants are rumored to be the creation of a druid who sought to merge the intelligence of a gorilla with the power of an elephant. This druid then awakened his creations and set them free to start their own society, whereupon they ran afoul of gnoll slavers. They routed the slavers and passed their first test at survival in the greater world, but the experience left them embittered towards gnolls. Gorillephants live in families or troops with leadership going to the senior member of the group, regardless of gender. Thus far, gorillephants have been reluctant to live in, let alone travel to, urban areas, but a handful of rebellious and adventurous gorillephants have made their presence known. Gorillephants are defined by their class levels—they do not possess racial Hit Dice. All gorillephants have the following racial traits. +2 Strength, +2 Intelligence, –2 Dexterity: Gorillephants are intelligent, physically powerful creatures, but quite ponderous. Large: Gorillephants are large creatures and gain a +2 size bonus to Strength and a –2 size penalty to Dexterity. Gorillephants take a –1 size penalty to their AC, a –1 size penalty on attack rolls, a –4 size penalty on Stealth checks, and gain a +1 bonus on combat maneuver checks and to their CMD. Normal Speed: Gorillephants have a base speed of 30 feet. Slam: Gorillephants can deliver a powerful slam (1d6 points of damage). 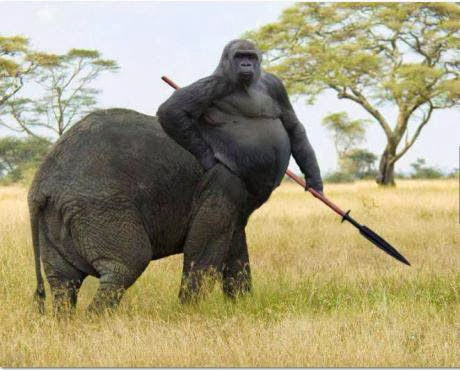 Natural Armor: Gorillephants receive a +2 natural armor bonus. Darkvision: Gorillephants can see in the dark up to 60 feet. Ancient Foe: Gorillephants gain a +2 dodge bonus to AC against gnolls and a +2 racial bonus on combat maneuver checks made to grapple gnolls. Plains Dweller: Gorillephants receive a +2 racial bonus on Survival checks. Stability: Gorillephants gain a +4 racial bonus to their Combat Maneuver Defense when resisting a bull rush or trip attempt while standing on the ground. I could not constrain this mashup to an animal, magical beast, or vermin, so I went with a fey creature. In a marvelous example of synchronicity, I discovered that the term for a group of stingrays is "fever," which really fit the surreal nature of the monarch stingray. I hope you enjoy the latest mashup monster, and I'll see you again in another hour! The final, and arguably coolest, mashup in this collection. This massive stingray has the coloration of a monarch butterfly; it gracefully swims through the water, and then emerges to continue its graceful movements in the air. Speed 15 ft., fly 60 ft. (good), swim 80 ft. Poison (Ex) Sting—Injury; save Fort DC 20; frequency 1/round for 8 rounds; effect 1d6 Wis; cure 2 consecutive saves. Some legends relate how faerie creatures had no set form in their primal dimension; it was not until they visited the mortal realms that they decided on appearances that pleased them. Many took on an idealized humanoid guise, but an occasional outlier would see beauty in the fauna or flora of the world. 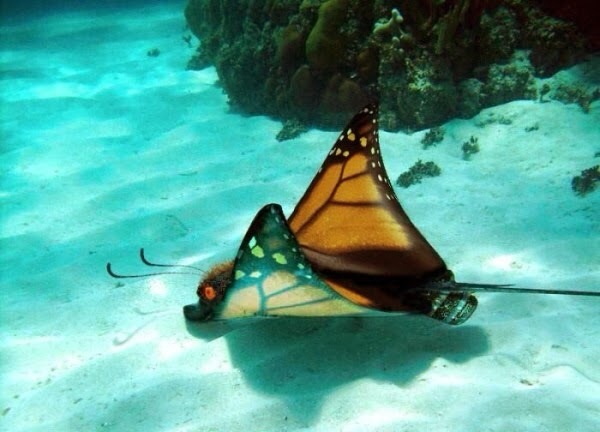 Monarch stingrays melded the delicate appearance of the monarch butterfly with the streamlined form of the stingray, and they remained in that shape. Though beneficent creatures, monarch stingrays often startle and spook those unaccustomed to the sudden appearance of a flying stingray. Their inability to speak Common does not help matters, and they must resort to their spell-like abilities to escape frightened mobs. The mashup marathon has jumped its last shark and, regrettably, landed in the jaws of the duckigator. I imagine this creature would be somewhat conflicted about attacking waterfowl, if it was working off more than instinct. I'll see you again in an hour with something less "fowl." The eyes of this creature's alligator head, set atop a duck's body, glare balefully. Speed 20 ft., fly 30 ft. (poor), swim 50 ft.
Alchemical Resistance (Ex) A duckigator gains a +4 racial bonus to its Armor Class when targeted by alchemical attacks. A merging of two foul-tempered animals resulted in even more foul-tempered duckigators. The creatures happen to be trainable, requiring a lot of work and patience. Usually, they accompany like-minded druids and rangers in their attacks and hunts. 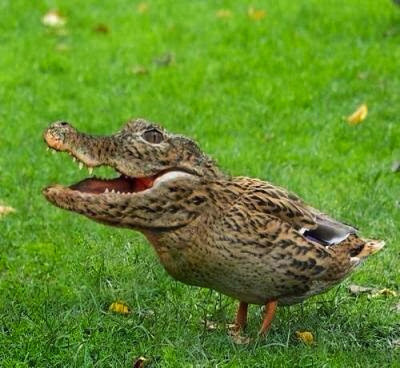 Duckigators are unwieldy fliers, but they make up for that somewhat with their resilience to alchemical compounds thanks to the mixture of oils found in waterfowl and hide possessed by crocodiles. Starting Statistics: Size Small; Speed 20 ft., fly 30 ft. (poor), swim 50 ft.; AC +2 natural armor; Attack bite (1d6); Ability Scores Str 13, Dex 15, Con 14, Int 2, Wis 12, Cha 9. Special Qualities alchemical resistance. 4th-Level Advancement: Size Medium; Attack bite (2d4); Ability Scores Str +2, Dex –2, Con +2; Special Attacks grab. The latest monster results from the unfortunate decision to combine a domestic cat with anything. Even though the sharkat is a vicious creature, it suffers from the dometic cat's distractibility, and will discontinue its attack when it see a bright red dot (for example). I hope you enjoy the sharkat, and I'll be back in an hour to continue the mashup marathon! This sleek, tabby-striped shark has the top part of a cat's head, including the ears, but its mouth is the decidedly toothy shark's maw. Distractible (Ex) If presented with a colorful or lighted display (such as from dancing lights), a sharkat must succeed at a Will save with a DC equal to 15 plus the effect's spell level or break off its attack and move towards the display. Each subsequent round, the sharkat can attempt another Will save to shake off the distraction (with a cumulative +1 circumstance bonus to its saving throw). 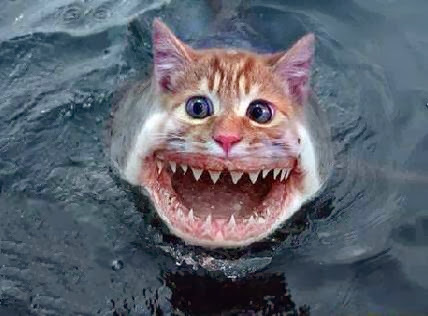 Sometimes, a creature hybrid does not turn out as expected, and sharkats are prime examples of this. Sharkats are powerful predators, but they have an easily exploitable flaw where a visual display will divert their attention away from prey. Due to this distractibility, sharkats do not make suitable animal companions. I am easily amused by the mashups that I receive, and I knew I had to do something with this one. 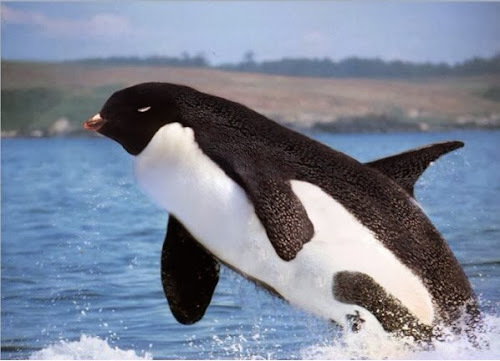 In keeping with my somewhat rubbish ability to name things, I present the tuxedorca. I'll be back in 60 minutes with yet another monster as the mashup marathon continues! This massive black and white whale has a penguin head; it makes a tremendous leap out of the water, clearing the surface by tens of feet. Surge (Ex) Once every 10 minutes, a tuxedorca can leap prodigiously from the water, doubling its swim speed and granting it a +16 racial bonus to Acrobatics when jumping from the water. Mixing a penguin with an orca created a manageably sized whale in the tuxedorca, which serves subarctic druids well. Tuxedorcas are not very maneuverable on land, but in the sea they move incredibly quickly, especially when they surge through the water. Generally, the creatures have a nasty temperament, but they do not display that too much to their masters. Starting Statistics: Size Medium; Speed 20 ft., swim 60 ft.; AC +2 natural armor; Attack bite (1d6); Ability Scores Str 17, Dex 17, Con 14, Int 2, Wis 12, Cha 11; Special Qualities surge. 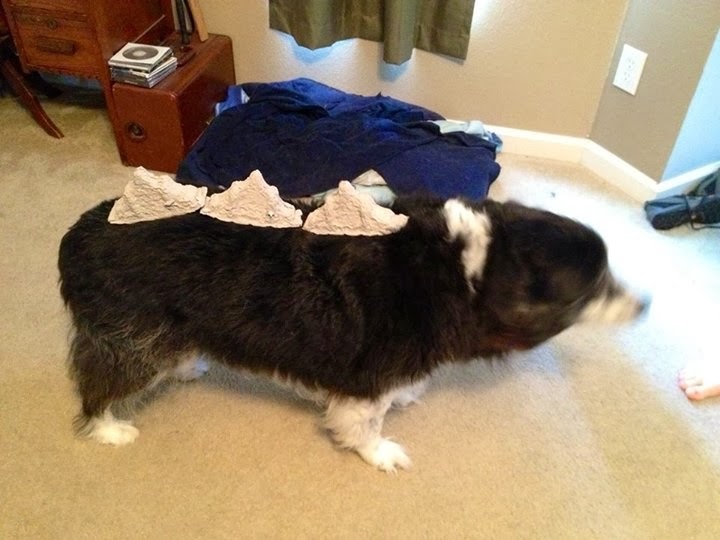 7th-Level Advancement: Size Large; Speed 15 ft., swim 70 ft.; AC +4 natural armor; Attack bite (2d6); Ability Scores Str +6, Dex –2, Con +2, Wis +2. The deagle was inspired by the article that spawned the past three images, but I wanted something different image-wise. 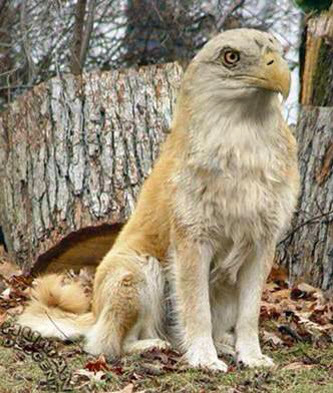 Unfortunately, I could not find a decent image that gave wings to the deagle, but this one captured the majestic feeling I was going for, so just imagine that the wings are underneath this creature's fur. Stand by for a new monster coming your way in an hour! This eagle-headed dog stares majestically before launching into flight. Commissioned by rangers who wished to go into battle with a companion, but one that would not flee from creatures with the ability to generate fear, deagles turned out to be the best choice. They are loyal creatures, albeit ones with an independent streak, and their ability to shake off terror puts their masters to shame. 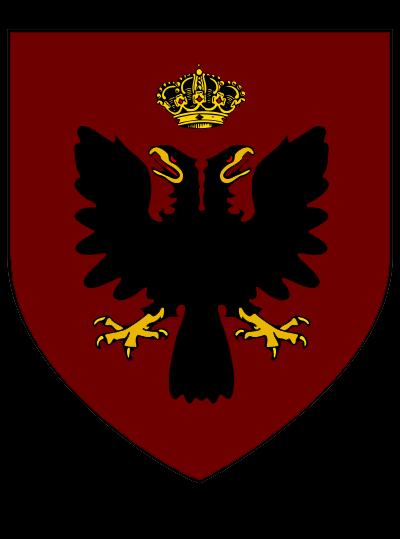 Deagles have become popular with halfling and gnome cavaliers and paladins who ride the beasts into battle. Starting Statistics: Size Small; Speed 30 ft., fly 40 ft.; Attack bite (1d4 plus trip), 2 talons (1d3); Ability Scores Str 10, Dex 16, Con 15, Int 2, Wis 13, Cha 11; Special Qualities immune to fear, low-light vision, scent. 4th-Level Advancement: Size Medium; Speed 40 ft., fly 40 ft.; AC +2 natural armor; Attack bite (1d6 plus trip), 2 talons (1d4); Ability Scores Str +4, Dex -2, Con +2. 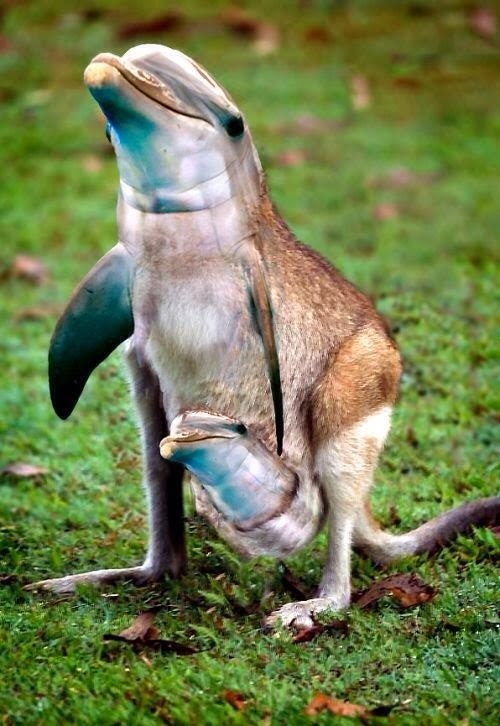 The second kangaroo mashup makes its appearance, this time in the form of the benign dolphiroo (which sounds like a cookie the Sea Scouts would try to sell). This ties the kangaroo with the shark and the spider for most mashups thus far today, which might mean that an "arachniroo" will certainly show up later. (Not so) sadly, I couldn't find an image for such a creature. Find out what the next monster is in 60 minutes! This creature, comprised of dolphin head and torso (including the front flippers) and a kangaroo from the pouch down to the hindquarters and tail, gives a toothy grin. Rarely, monster creators plan something other for their creations beyond acting as killing machines or to satisfy morbid curiosity. In the case of the dolphiroos, their makers designed them to help others on land and in the sea. The creatures are friendly and especially shine in cases where they must rescue someone from drowning, using their powerful legs to propel them toward the rescuee. Dolphiroos defend themselves when attacked and use their kicks and hydraulic push to drive away attackers. Next up is the perhaps awkwardly named crippo. It took a little while to come up with a special ability for this one, until I hit upon the idea that the crab's constrict attack could continue beyond death (at a slight decrease, since the creature is no resisting any attempts to break free). I hope you like this tenacious beast (evidently held by a Gargantuan humanoid), and I'll be back in an hour with another monster. Rather than its normal legs, this hippo has three pairs of crab legs holding it up; two clamp-like claws complete the creature. Speed 30 ft., burrow 10 ft., swim 30 ft. Beyond Death (Ex) If a crippo dies while constricting a foe with its claw, it does not release the claw. The crippo's CMB and CMD take a –4 penalty for the purpose of maintaining the grapple. Fierce Grip (Ex) A crippo only takes a –5 penalty to maintain a grapple with a claw if it chooses not to conduct the grapple normally. Crippos combine the crab's aggressiveness with the hippo's tenacity, resulting in creatures that can harm opponents even after they die. Crippo creators thought they would devise something that could hold prisoners captive, but they failed to count on the creatures' exuberance in crushing captives in their claws. 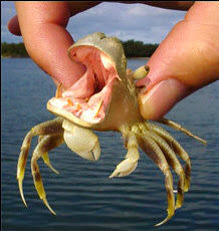 Many cast-off crippos now terrorize shallow water and beaches alike. The first vermin in today's lineup, the zebrull ant comes from this set of mashup images. The image makes it seem kinda pathetic, but its bite, poison, and inherent ability to avoid being hit make it a decent low-level opponent. High noon (well, CST) marks the midpoint of the mashup marathon. Yet another monster will make its appearance in an hour! 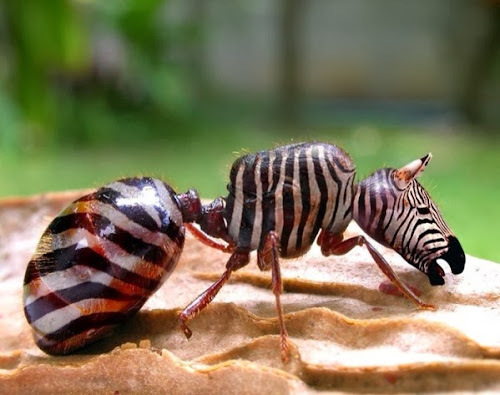 This gigantic ant has a striped pattern similar to that of a zebra, which somehow makes it difficult to fully focus on the ant. Blurred Pattern (Ex) The patterning on a zebrull ant continuously grants it the benefit of blur. Poison (Ex) Sting—Injury; save Fort DC 13; frequency 1/round for 4 rounds; effect 1d3 Con; cure 1 save. The save DC is Constitution-based. 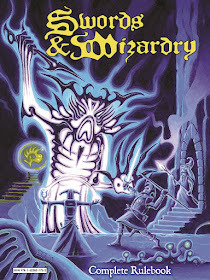 The creators of the zebrull ant initially regarded their creation a failure, since the creatures demonstrated the same lack of intelligence found in the ant component. However, they revised their reaction when they determined that the striped pattern on the creatures made them difficult to target. 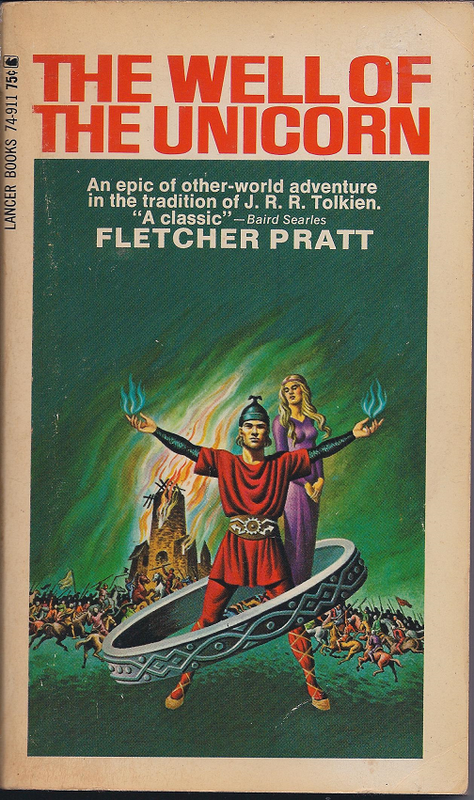 Those who kept the zebrull ants use them as shock troops or front-line combatants, while those who did not unleashed the creatures into the wild, where they have devastated great swaths of land. The mashup marathon returns yet again to the sea. I gravitated to a lot of aquatic monsters because they're somewhat underrepresented in the game, and also to give Patrick a handful of monsters he could hopefully use in his games. The halfway point approaches in another hour. See you then! Patrick found the moose shark here. The shark gliding through the water bears an incongruous moose's head; or the moose taking a swim bears an incongruous shark's body. Speed 10 ft., swim 80 ft. Flexible Antlers (Ex) A moose shark's pliable antlers allow it to grapple opponents with its antlers. Additionally, it can inflict bite damage to a grappled foe and bite another opponent within reach. 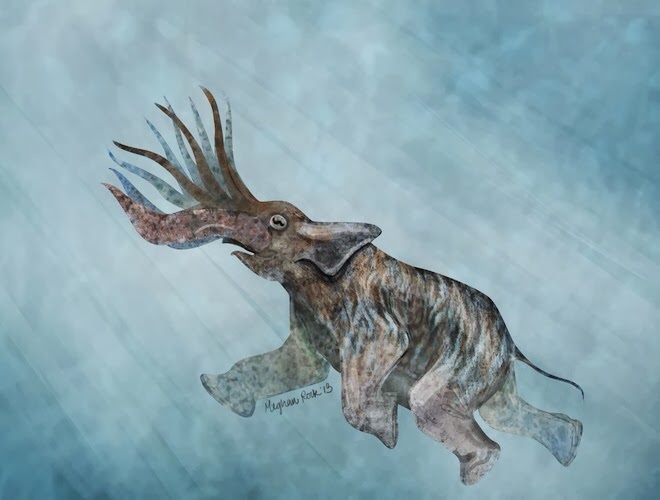 The idea of combining a moose with a shark and imbuing the moose portion with flexible coral-like antlers may have seemed like a clever idea, but the resulting moose sharks proved to be intractable. As a result, the failed experiments were set loose to wreak havoc in the ocean, where they attack ocean dwellers and seagoing vessels alike. 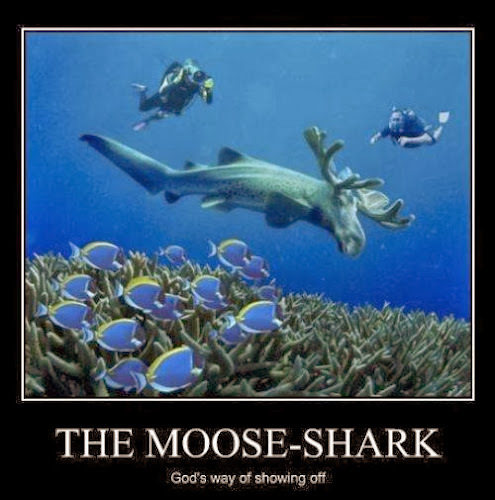 Fortunately, no known examples of a land-dwelling version of the moose shark exist. With the gazelligator, I have exhausted the Wired article with all its fun mashups. This is another creature that will surprise characters, especially since it will start combat off the battle mat (assuming you use one). The next mashup monster will come from a new source and will arrive in 60 minutes! At first appearing to be a typical, fast-running herd animal, the creature turns its head, revealing a long, toothy snout. Sprint (Ex) Once per hour, a gazelligator can triple its base speed when charging or running. Most likely created by misguided (or demented) druids, gazelligators fuse the ferocity of an alligator with the burst of speed common to gazelles. The resulting creatures terrorize prey on the open plains where gazelligators can travel hundreds of feet in seconds to fell unprepared victims. Gazelligators rarely back down from a fight, even when their opponents clearly overmatch them. This light-themed mashup combines the humble dog with the firefly to create a nice glow-in-the-dark animal, but it can do more than shed light. As a companion to a character, the lumihound proves extremely useful, especially against difficult-to-see foes. As a companion to an opponent, the lumihound may thwart the characters attempts at stealth. See you in an hour with another mashup! 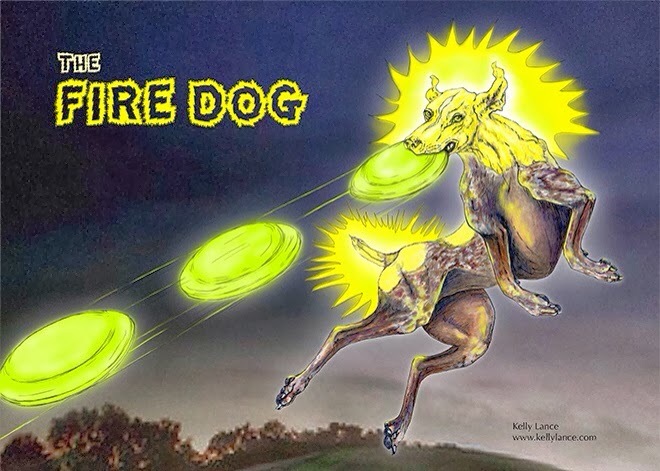 This otherwise normal dog glows with an eerie green light. Faerie Fire (Su) When a lumihound bites an opponent, it illuminates that opponent with faerie fire. Dogs make excellent trackers, and the creators of the lumihound combined fireflies with dogs to make hounds that could hunt at night. As an unexpected side effect of the process, lumihounds can spot invisible creatures and can impart their illumination to targets they bite. Due to their superior tracking skills and trainability, lumihound puppies command prices around 1,000 gp. The mashup marathon takes a small break from murderous creatures (even those that require provocation) for a happy bird that wants to bring light and joy into your characters' lives. Yes, it might cause the characters to become hypnotized or confused, but that's a small price to pay. The light mini theme continues with the next monster, which shall arrive in an hour! 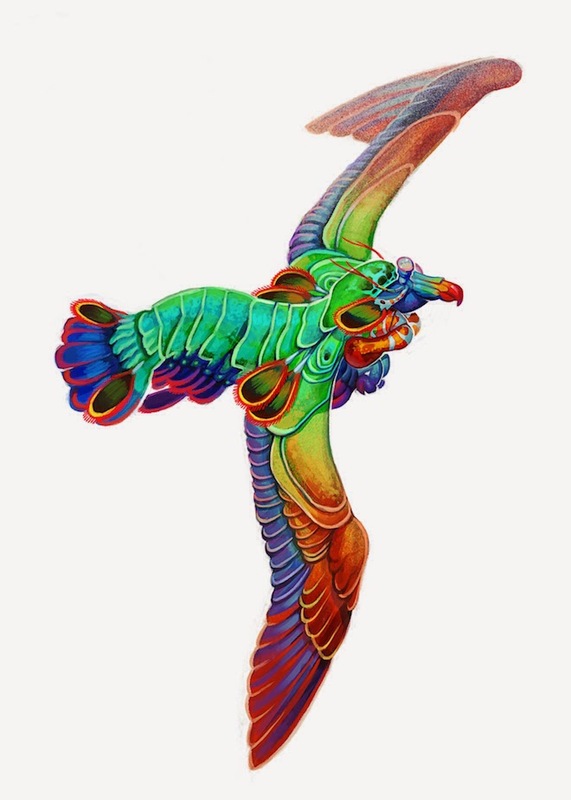 A bird breaks off from its flock, featuring similarly bright and colorful birds, and provides a dazzling show as it flies by, motes of light trailing it. 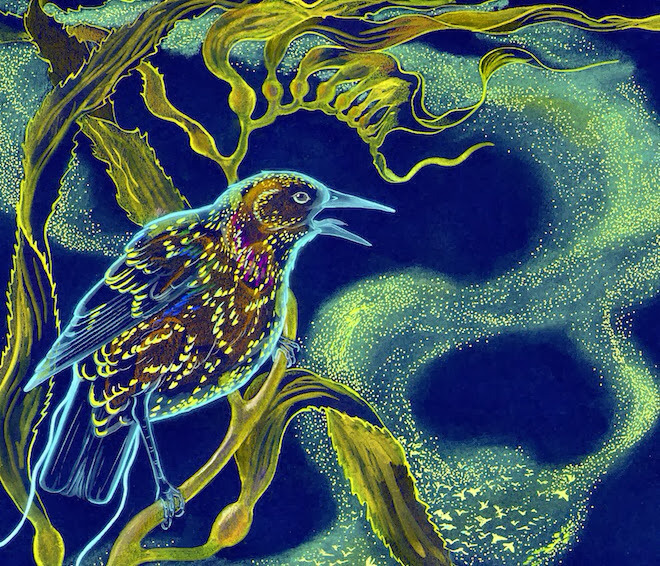 Space 2.5 ft.; Reach 0 ft.
Dinoflagellate starlings are bioluminescent birds that constantly give off light, making them impossible to miss. Not physically powerful, the starlings make up for this lack by using the patterns of light to fascinate or confuse predators. These birds are fairly intelligent and will aid those who treat them well. Another in a line of "surprise" aquatic creatures, the piranhatee at least has the decency to stay in the water. Of course, it is a tenacious predator once it catches even the hint of blood from nearby creatures, much to the dismay of those who assume it is just a gentle manatee. Check back in an hour to see if the mashup monsters have left the sea! 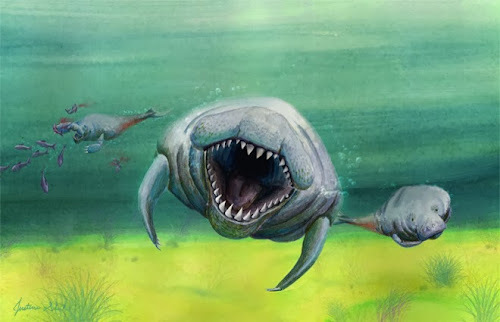 This gray animal has wrinkled skin and a large snout; it swims lazily in the water, appearing to be a gentle giant, until it opens its mouth and reveals two dozen razor-sharp teeth. Bloodlust (Ex) A piranhatee typically attacks in self-defense and only with its slam attack, until it injures a creature, or something else injures a creature within 180 feet of the piranhatee, at which point it uses its full array of attacks. By depriving the creature of its sense of smell, it will remain in or return to its docile state. Intelligent underwater creatures with a penchant for melding animals together develop piranhatees to act as pets that can quickly turn into vicious killers at the smell of blood. When possible, these mad creators will engineer piranhatees to ignore the chemical composition of their own blood, so the creatures will not turn on them at inopportune moments. Alternatively, they acquire or create devices that shut down a piranhatee's sense of smell. The pterodactwhale is another creature that will surprise characters staying away from the water in false assurance of their safety. This mashup is considerably less aggressive than the arachnishark, so characters who do not provoke the creature should have no problem. Another creature awaits you in an hour! This impossible creature is a large, winged whale that glides fairly awkwardly through the sky. Speed 10 ft., fly 40 ft. (clumsy), swim 60 ft.
Crush (Ex) A pterodactwhale can land on foes as a full-attack action, using its whole body to crush them. This attack affects Medium or smaller creatures and affects as many creatures as fit in the pterodactwhale's space. Creatures in the affected area must succeed at a DC 16 Reflex save or be pinned, automatically taking 2d8+12 bludgeoning damage during the next round unless the pterodactwhale moves off them. If the pterodactwhale chooses to maintain the pin, it must succeed at a combat maneuver check as normal. Pinned foes take damage from the crush each round if they do not escape. The save DC is Constitution-based. Sometimes, creators who crossbreed creatures enjoy the challenge of devising something that seems otherwise impossible in nature. Pterodactwhales are one such frightening concept, managing to barely stay aloft and landing frequently to rest. During these landings, pterodactwhales can destroy property or mash victims to a pulp. In the water, the creatures are much more graceful, and those who witness pterodactwhales leaping from the water to take short flights speak in awe of the spectacle...provided they have not been crushed by a fatigued creature. 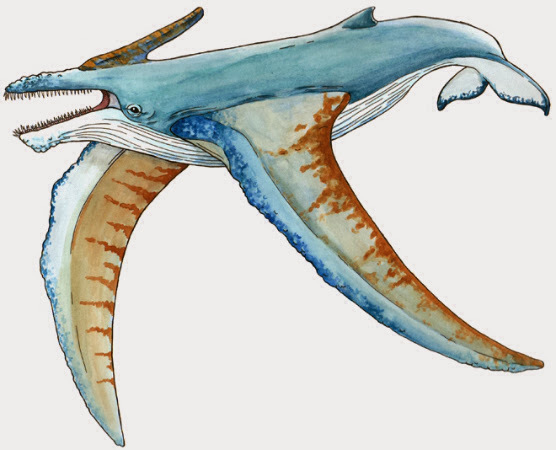 Pterodactwhales can also build their whale song to a crescendo, deafening and shattering the bones of those who hear it. Mantis shrimps have captured the imagination of many people in the past year, so seeing a mashup that features a mantis shrimp was no surprise. I hope I captured its ability to perceive its surroundings in an entirely different fashion to any other creature. Another mashup will make its way onto the blog in another 60 minutes! This giant, multihued bird has a hard carapace that seems not to affect its ability to fly. Stun (Ex) When a stomatopetrel strikes a target with its slam attack, the target is stunned for 1 round if it fails a DC 17 Fortitude save. If the stomatopetrel succeeds at a critical hit, the target is stunned for 1d4 rounds if it fails the Fortitude save. The save DC is Constitution-based. Derived from a combination of two highly aggressive creatures, the mantis shrimp and the petrel, stomatopetrels are near murderous flying beasts possessing an array of senses that render hiding from them nearly impossible. Stomatopetrels prefer to fly past their prey and attack with their mighty carapaced wings, which potentially cause their prey to become insensate, whereupon the creatures alight upon their victims and further pummel them while also attacking with their less powerful beaks. Depending on your view of Lovecraftian elephants, one could argue that the cuttlephant is nicer than the taranturaptor. I imagine that on the surface this creature would look strange, while underwater it would be quite disturbing, especially as it deftly makes its way through the water. The mashup marathon will continue with another monster in one hour's time! This swimming elephant has a slightly elongated head and several tentacles surrounding its trunk. Trumpet (Ex) Once every 1d4 rounds as a swift action, a cuttlephant can sound a highly disconcerting set of notes that dazes all creatures within 30 feet (the range extends to 60 feet underwater) that fail a DC 13 Will save. This is a mind-affecting, sonic effect, and the save DC is Charisma-based. Many creators of weird monsters desire something as effective on land as in water, and cuttlephants are no exception. Combining the sheer power of elephants with the camouflage ability of cuttlefish, cuttlephants also possess a strange ability to daze their foes with a series of otherworldly notes, as befits their appearance. Despite their ungainly appearance, cuttlephants are extraordinary swimmers and can keep pace with (or exceed the pace of) most non-native underwater creatures. As you may have noticed with many other mashups featured here, spiders are versatile creatures and add horror even to something already horrifying. The taranturaptor (and the arachnishark before it) give proof to that idea. Hopefully, the next monster will be a little nicer. A raptor's head and partial trunk extends from this enormous spider's body; each of this creature's legs ends in a raptor's dewclaw. Poison (Ex) Bite—Injury; save Fort DC 15; frequency 1/round for 6 rounds; effect 1d6 Dex; effect for every 2 points of Dex damage dealt, base speed decreases by 5 feet; cure 2 consecutive saves. 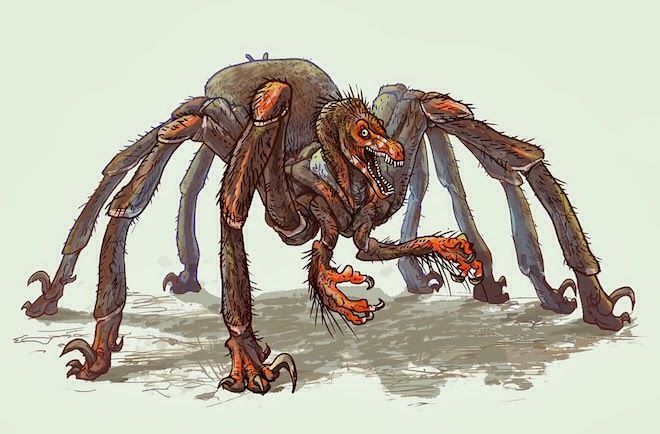 Taranturaptor creators decided to add a dose of raptorial cunning to a spider's body to create a more effective killing machine, but one they could theoretically control without the aid of spells or abilities they did not possess. A taranturaptor bite inflicts a poison that slows their prey, making it much easier for the creatures to overtake fleeing victims. While the dewclaws look impressive, they deal no effective harm in combat, but they allow the creature to climb surfaces incredibly well. Next up in the mashup marathon is the flying squirrelobo, combining the graceful not-quite-flying ability of the flying squirrel with the hunting prowess of the wolf. See you in an hour with another creature! 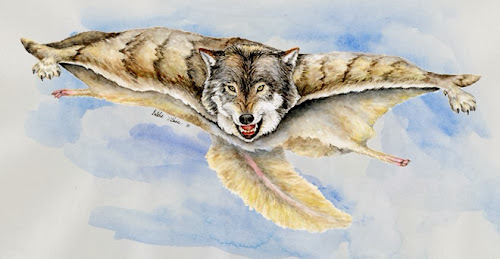 What appears to be a wolf with flaps of skin connecting its limbs to its body drops down from a tree and glides to a landing. Glide (Ex) A flying squirrelobo can launch itself from height to gain a fly speed of 40 (poor maneuverability) for 1 round per 10 feet of elevation that it starts its flight. Not content with a rodent with gliding ability, flying squirrelobos' creators wanted a predator with limited flight capability. Flying squirrelobos possess claws that allow them to climb most surfaces but are not powerful enough to use as weapons. 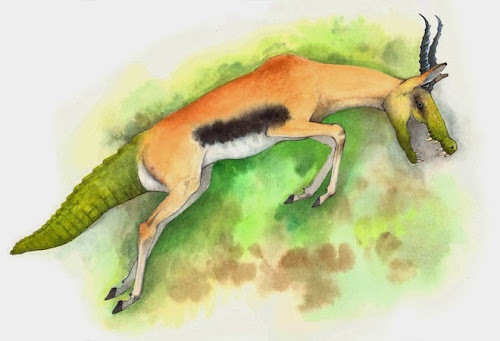 They attack unsuspecting prey by climbing trees or cliffs and gently and quietly descending upon them, but they have no problem running down prey if they start at the same level. Starting Statistics: Size Medium; Speed 30 ft., climb 20 ft., glide; Attack bite (1d6 plus trip); Ability Scores Str 11, Dex 12, Con 12, Int 2, Wis 13, Cha 11; Special Qualities low-light vision, scent. 4th-Level Advancement: Size Medium; Speed 40 ft., climb 20 ft., glide; Attack bite (1d8 plus trip); Ability Scores Str +2, Dex +4, Con +2. The second mashup combines the kangaroo with the panda and is considerably less terrifying than the previous mashup (at least for me, that is). A new mashup will appear in an hour. Stay tuned! Another mashup from this article. This tall, black and white creature grazes on grasses and tree leaves; it features crushing paws and powerful hind legs. Slow Metabolism (Ex) Due to the pandaroo's slow metabolism, it only requires half the food other creatures of its size require. It can go 5 days without food, and it gains a +2 racial bonus on its Constitution checks to avoid taking nonlethal damage. Additionally, a pandaroo inflicted with a poison doubles a poison's onset time by 1 minute—or sets the onset time to 1 minute for poisons without one—and doubles the poison's frequency. The creature also gains a +2 racial bonus on Fortitude saves against poison. Pandaroos are normally gentle creatures that take on the kangaroo's general body shape, but eschewing that animal's rodent-like facial appearance and short forelimbs in favor of the panda's head and powerful forelimbs. 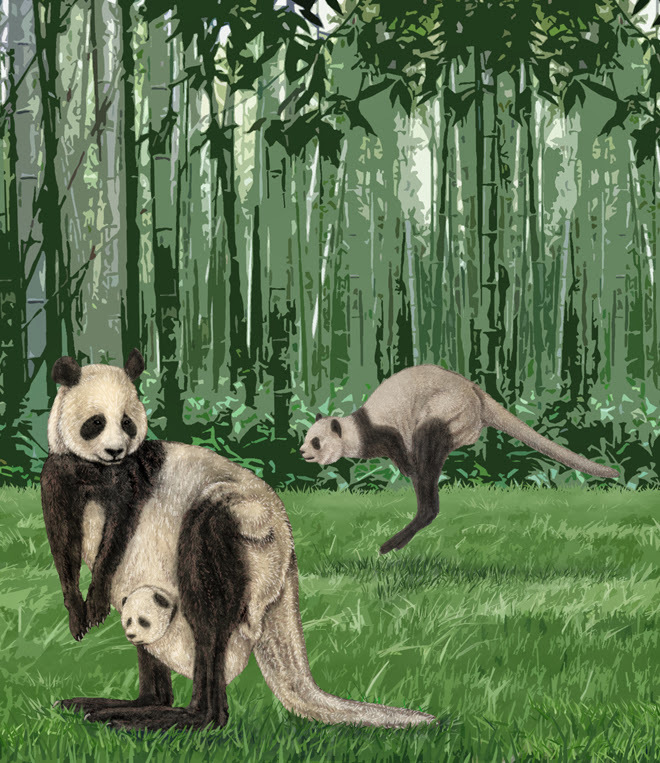 Pandaroo creators enhanced the typically slow metabolism of the panda half mostly to cut back on the costs of feeding the creatures, but they were delighted to discover that this feature made pandaroos somewhat more resistant to poison. Starting Statistics: Size Medium; Speed 30 ft.; Attack 2 claws (1d3), kick (1d4); Ability Scores Str 12, Dex 13, Con 12, Int 2, Wis 11, Cha 7; Special Qualities low-light vision, slow metabolism. 4th-Level Advancement: Size Medium; Speed 40 ft.; AC +2 natural armor; Attack 2 claws (1d4 plus grab), kick (1d6); Ability Scores Str +4, Dex +2, Con +2, Wis +2. Welcome to the Frightful Fridays! Mashup Marathon! I have received a plethora of mashup images over the past year, and I figured I would share them with you over the course of the day. I also figured I'd start off with a spider creature, since friends who know of my "love" of spiders like to throw images of them at me. I'm pretty sure I would immediately drop dead of fright if I saw something like this emerge from the water. I will try to do something beyond just mixing and matching monster stats for each of these monsters (for example, the arachnishark's poison inflicts bleed damage, representing the shark's desire to scent out bleeding prey). I hope you like the arachnishark, and check back in an hour for the next monster in the lineup. Thanks for reading! This charming creature can be found here. This creature's dorsal fin clearly marks it out as a shark, but it reveals its complete form as it scuttles out onto shore on eight large, hairy legs. Speed 30 ft., climb 30 ft., swim 60 ft. Poison (Ex) Bite—injury; save Fort DC 17; frequency 1/round for 6 rounds; effect 1d4 Strength damage; effect 1 point of bleed damage (the bleed damage increases by 1 each time the victim fails the Fort save, and restarts at 1 if previous bleed damage has been healed); cure 2 consecutive saves. Arachnisharks derive from two delightfully nightmare-inducing creatures, and the inherent nastiness of their creators carries through into their own demeanors. Despite their relative lack of intelligence, arachnisharks seem to derive pleasure from fooling unsuspecting victims who presume that being land-bound protects them from the creatures. 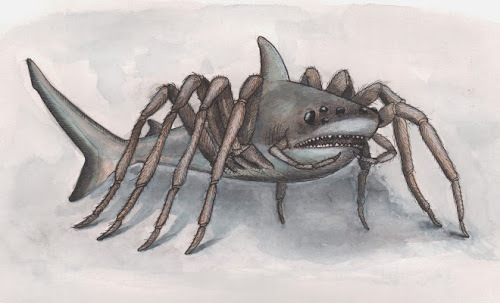 Arachnisharks also have a deadly poison that saps their victims' strength and induces internal bleeding, which further drives the creatures' feeding frenzies.